Cielo homes are located in the coastal community of Ranch Santa Fe. The Cielo community has a stunning neighborhood clubhouse with well manicured grounds and an olympic size pool that is referred to as "Club Cielo." The community offers many association amenities which include 2 tennis courts, fitness center, children's climbing wall, half basketball court, sand volleyball court and barbecue area. Monthly homeowners association dues in Cielo include common area maintenance, the 24 hour guard gated entrance and the association amenities listed above. The community does have a small Mello Roos tax which is paid on a yearly basis. Cielo is a wonderful mixture of large custom estates homes grace the grounds of this upscale neighborhood. Within the community there is a separate section called "The Estates" where you will find luxury homes located at one of the highest points in Cielo. Two of the newest neighborhoods within Cielo is the Estancia at Cielo and Upper Cielo communities. Estancia at Cielo offers homes built by Taylor Morrison home builder with floor plans up to 5,599 square feet. Upper Cielo community is located at the top of Cielo and features 41 homes that range up to 4,579 square feet. If you are thinking about building a home in Rancho Santa Fe, Cielo offers many lots for sale with some of the best views in the entire Rancho Santa Fe area. The community is still building custom homes as well as the neighborhood known as "Montagna at Cielo." 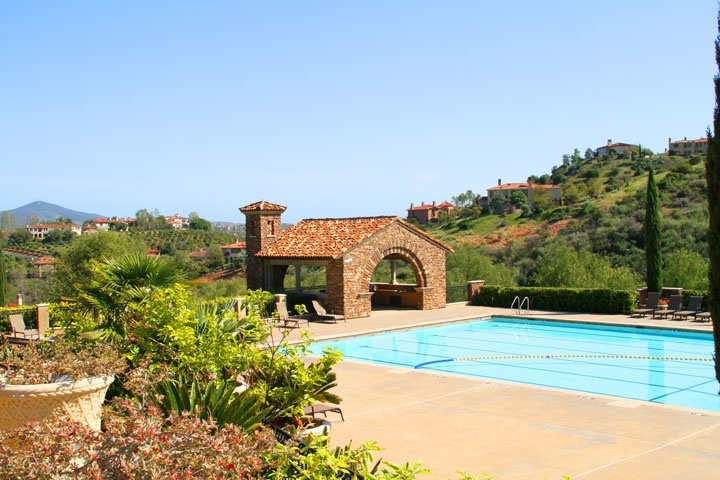 Residents of this community enjoy seasonal activities like the annual Easter Egg Hunt and Sunset Socials as well as being located in the award winning Rancho Santa Fe school district. This includes Torrey Pines High School, Canyon Crest Academy and San Dieguito Academy. At the base of Cielo you will find a quaint shopping area called "Cielo Village" as well as a Fire Station. We showcase all the homes for sale and for lease in the Cielo neighborhood. Questions? Let our team of Rancho Santa Fe Realtor Associates help you. Please contact us at 1-888-990-7111 today.